Once thought of as a novelty from a bygone era, the ukulele has made an astounding rebound in popularity in recent years. The adoption of this diminutive 4-string instrument by many of today’s popular artists has introduced the “uke” to a whole new generation of fans and created a legion of contemporary enthusiasts. While capable of producing beautiful, sophisticated music, the ukulele is also a very accessible, enjoyable instrument for the whole family. 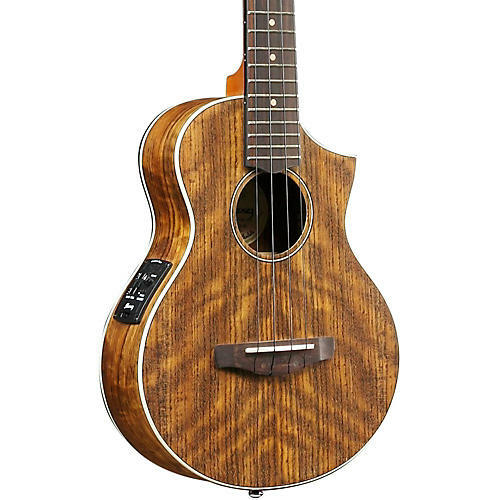 The UEWT14E is a Tenor size, cutaway EW style body ukulele. Tenor ukes are larger than Soprano and Concert models. The body (top, back and sides) is made from ovangkol, a wood found in Western Africa, known for its beautiful figuring and rosewood-like tone. Other features include a maple rosette, rosewood fretboard and bridge and Grover open gear tuners for superior tuning stability. An Open Pore Natural finish allows the body to resonate more freely for improved tone and projection. For stage amplification, the UEWT14E features an Ibanez under-saddle pickup and a UK-300T preamp with an onboard tuner. Comes strung with Aquila NYLBLACK Strings.